There is a village called Jatinga in the state of Assam in North Eastern India nestled among beautiful hills. On ordinary days, Jatinga is like any other Indian hilly village characterized by lush green vales, fertile fields, placid lakes and rich flora and fauna. But come September, this village bears witness to a unique and bizarre phenomenon. At night, many species of birds get attracted to the lights lit by villagers on the ground and mysteriously sway away from their flight path. So intense is their attraction, that they forget all sense of direction and blindly make their way towards the light source, colliding with walls and poles in the process. Many birds are killed or critically injured on impact and are trapped by waiting villagers who later cook and eat them with great relish. Scientists from all across the world have made numerous attempts to fathom the mystery behind this strange avian hara-kiri, but no plausible theory has been formulated yet. Each year, this mystery continues unabated. In very much a similar manner, a large number of Indian students and working professionals get attracted towards the ‘bright lights’ and ‘green pastures’ of foreign shores. Every year, a huge number of people are found waiting in line outside embassies of foreign nations for long hours all waiting to get the prized visa stamp on their passport, akin to devotees waiting in queue in temples for a darshan of the lord. This trend of migration known as the ‘brain-drain’ started way back in the sixties, when ‘developed’ countries such as the US and other nations liberalized their immigration policies and opened their doors for skilled technicians, medical personnel, scientists, engineers etc. to people from all across the world. Many Indian citizens, taking advantage of the leniency made their way and have settled abroad ever since, with most of them prospering and making a good name for themselves. The number of skilled personnel making a beehive for foreign countries has only increased over the decades, especially in the late nineties and the early years of the new millennium with the IT industry boom. One occasionally hears of Indian born people making the news abroad for stupendous achievements like the late Kalpana Chawla and more recently Satya Nadella. But again this makes me think, what were to happen if these people never left Indian shores and had decided to stay in India? Would they have made a difference to our country in the present day? Would they have been as successful in India as they became abroad? Why do so many qualified people in our country look overseas for career advancement? What is it about settling abroad that attracts so many professionals to risk huge amounts of their savings and leave home? There is no simple answer to the question above. There are many reasons which people cite for taking the plunge (or more appropriately ‘leap’) to go overseas. Students blame lack of suitable employment opportunities and working professionals cite poor pay-scales, dirty politics, nepotism and low scope for career advancement as their reason to fly. In the short term, some people might say this would help in bringing down the number of job aspirants in an already saturated Job market. But in the long run, our country would definitely end up the loser. For each talented and skilled person who leaves our shores there is a void created in that particular skill which becomes difficult to replace (as most of the professionals with a similar level of skill and experience are also probably flying abroad). Companies and institutions have to spend huge amounts to bring new trainees to the same caliber only to watch them fly away sooner or later. Foreign companies and institutions are the ones to prosper from the multitude of talent. Is it not a great injustice to our country to see our professionals apply their skill and knowledge for the betterment and advancement of other countries rather than our own? And why this Kolaveri-di towards our nation, fellow countrymen? Who is to blame for this continuing trend of foreign migrations? Is it the Government which cannot provide suitable infrastructure and enough job opportunities for people? Or is it the attitude of the people themselves who find foreign shores more appealing? Let’s analyze all the reasons for this current trend one by one. Our education system is like a factory assembly line which produces a huge number of graduates from various streams every year. Like tributaries, they flow into the wide river of job aspirants which only gets larger over time. But the demand far outstrips supply and this leads to widespread unemployment and frustration among'st today’s youth. Tired of knocking the doors of various organizations and waiting in endless lines of walk-in interviews, many pack their bags and leave for brighter prospects overseas. Surely our government should stem the flow by creating more job prospects and bolstering the economy, encouraging youth to stay back rather than leave. Our education system is also very linear. Engineering, Medicine, Commerce and Arts are the only mainstream options available for students to pursue a career. These professions are thoroughly saturated and there is very little scope for career advancement in other fields. Only very recently have other streams like Hotel management, Catering, Fashion Design, Photography, Multimedia, Animations and 3D graphics started picking up. But the situation more or less stays the same. People who desire to make a career in the streams mentioned earlier have very few local / national options and have to move abroad to make a career. Money, is the second reason for migration. While our national economy has picked up in recent times and professionals are now paid more than they were previously, there is still a huge disparity in pay scales between domestic and international workers of the same caliber. Work-Politics and Nepotism also play a huge hand in dissatisfaction among working professionals. Our work culture is mostly autocratic with the person on top holding the reins of power. Only those who fall into his/her good books are the ones who rise up. Talent, dedication and hard-work take a back seat. Of course, these factors do exist in all companies: domestic or foreign, but the system abroad is such that due recognition is given to a persons’ talent, hard work and dedication irrespective of his/her nationality, caste, creed and religious affiliation. Money is what causes the third reason known as the ‘domino’ effect. A person goes abroad and starts earning. He/she then tells his/her friends back home that they are wasting their talent and hard-work slogging in out in India when they can easily earn four to five times the amount abroad. He/she sends pictures of himself / herself having a grand time in various locations which we mostly get to see on TV and movies only, buys a new car etc. etc. (you get the picture). Slowly, restlessness and a sense of dissatisfaction creeps up among people here. Parents and spouses too play an important part in this effect when they start comparing us to others who are seemingly doing better than we are at the moment. “Look at him. It’s hardly been three years since he has settled abroad and already his parents have brought a new house and car thanks to the money he’s sent them. Why don’t you do something similar?” are just some of the few dialogues we have to face at home. Sooner or later, we end up taking the plunge. But things are not as hunky-dory abroad as they seem. There is intense competition, much more cut throat as compared to home because we now have competition from various aspirants from other developing countries such as China, Pakistan, Egypt, Brazil etc. who all vie for the same post. Foreign economies frequently face downsides and there are regular job cuts undertaken by various firms. In such a situation, finding a job becomes even more difficult. Even if one does manage to find a job, the struggle simply does not end there. We have to now work our a**es off to impress our bosses and cement our place in the team. This often makes us work late nights and our health and personal life take a beating. Pay scales for new Joinees are lesser than that compared to local workers (which is why we got that job in the first place). The locals look upon us with contempt as job-snatchers and we end up being targets of racist fury. Yet we stick around and weather all the insults hurled upon us knowing that all the money we have risked will come to nought if we leave everything and go back home. So we stay and endure. And all for what: just to earn a few friggin’ thousand dollars more, buy that super SUV of your dreams, buy a huge condo or build a huge bungalow back in India, things which are never going to stay with you permanently. The fourth and possibly the biggest factor contributing to the brain drain is the attitude of the Indian people themselves. Our people tend to mostly look at the negative factors at home rather than concentrate on the positives. Sadly, this attitude has passed on from generation to generation with the result that most of the young people nowadays tend to look overseas for brighter prospects rather than stay back home. People do not realize that there are tremendous business opportunities at home waiting to be exploited. 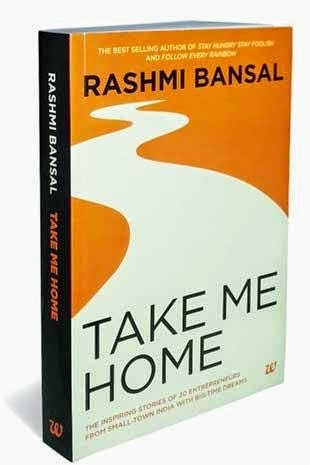 I was recently reading a book by Rashmi Bansal called “Take me Home”. This book is a collection of twenty beautiful stories of Indians who decided to take the road less traveled. They rebelled against conservative thought and decided to set up their businesses in India rather than pursue menial jobs. The stories cover people from different backgrounds, ranging from people with degrees from world class institutions to people who could not afford even a formal school education; people who left lucrative careers abroad to people who had never left Indian shores. But they all had a goal, a purpose and a vision and the strength and determination to carry out their plans. Their success only shows that we are hindered by our attitude alone. Consider a moment to think: If all the successful business magnates of America and other nations had adopted a similar negative attitude, most of the huge International Mega-corporations we see today would never have existed. These people, instead of migrating to other countries with greener pastures decided to stay put and make things work at home. Most of them did not have the means or riches to start off successfully, but what they had was loads of determination and the desire to succeed despite all odds. Slowly and steadily they persevered and overcame all obstacles and challenges which came their way. The results are there for all to see.There is a saying which goes, “Make a better mousetrap than one that exists already, then no matter where you live: the world will beat a path towards your door.” And that is what they have done exactly. But all is not lost for us. With the advent of globalization and the technical revolution, things are steadily improving in India. Migrating abroad is mostly losing its sheen and many youngsters are now willing to stay back home rather than fly. In fact, many people are returning from abroad to pursue new avenues. Progressive thinking backed by sound economic policies have encouraged many people of think beyond their comfort zone and a new generation of businessmen and entrepreneurs have been born. People are now exploring other career options and are wandering off the beaten path. The change has just begun and it might be a long way before we reach critical mass, but at least it’s a step in the right direction. Lets not lose our direction and end up like the birds in Jatinga. Instead of migrating to other nations, let’s increase our self-respect in our own eyes and that of other nations by making our country a model destination to which other people aspire to migrate to. There are numerous pitfalls and obstacles on the way, but with positive thinking, determination and courage, we will surely reach our goal. As the legendary Steve Jobs said, “Stay Hungry, Stay Foolish.” But I would add one more line “Stay at home.” (meaning stay in your own country).